Railpictures.ca - John Pittman Photo: Long time not seen, a GMD1 (CN 1439) is centre unit of a trio of locomotives working Aldershot Yard. Note the non-standard small 1439 digits on the black cabside of the GMD1. Lead unit CN 9482 (GP40-2(L)W in CN North America scheme) is another uncommon sighting. Third unit CN 7039 is more typical of the GP9rm and GP38(-2W) power most often seen working this yard. Same set of power was observed in Aldershot Yard the next day, with the sequence of locomotives reversed. | Railpictures.ca – Canadian Railway Photography – photographie ferroviaire Canadienne. Caption: Long time not seen, a GMD1 (CN 1439) is centre unit of a trio of locomotives working Aldershot Yard. Note the non-standard small 1439 digits on the black cabside of the GMD1. Lead unit CN 9482 (GP40-2(L)W in CN North America scheme) is another uncommon sighting. Third unit CN 7083 is more typical of the GP9rm and GP38(-2W) power most often seen working this yard. Same set of power was observed in Aldershot Yard the next day, with the sequence of locomotives reversed. 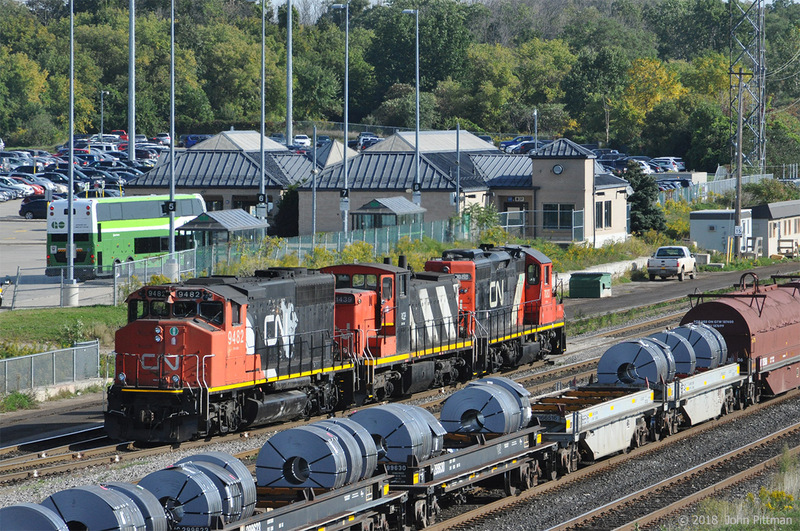 Correction: Third unit CN 7083 … The steel coil cars presumably carry production from a Hamilton steel mill. Aldershot GO/VIA station is behind.